Miles Tilman - "Underland EP"
On this EP Miles Tilmann creates mellow Ambient Trance style structures that are woven with abstract collages ideally suited for the chemical generation. Here on Underland we have a sort of collection of scenes that follow closely in the same footsteps as the pioneers of the electronica scene Tangerine Dream laid 30 years previous. But here we have elements of other more dance-orientated stuff. The atmospheres are set firmly in the Tangerine Dream mould, but the beat structures lean towards The Orb or mellow Eat Static. The opener is a 5.25 exploration titled 'Unfold'. It starts mellow and progresses through floating chord shapes that are evidently Tangerine Dream, before the thud of an electronic Bass Drum breaks into the frame with that ever so popular hi-hat rhythm. I love the synthy atmos and it follows on into 'Letting' a 1.29 deep Bass string vibe that spills dreamlike into 'Underland'. This piece has more Tangerine Dream trademarks; the chords and sound are similar to 'Mysterious Semblance at the Strand of Nightmares' from the 1974 classic Pheadra and they set quite a good scene. The rhythm is more like a noise oscillator beat that offers something very mellow and relaxed, and for all of its 3.49 it seems to grow and evolve. 'Sunday' and 'Mother/Father' are taken in similar vein to 'Underland', all having great sounds littering throughout them all. They flow nicely and almost allow you to see the floating images that the music is forming. 'Warm/Cool' is similar to 'Memory4' in every aspect. Both are nice strange little chordy pieces lasting 2.23 and 1.13. 'Memory4' moves into 'Derail', a 9.51 motion through the ether. In some ways it reminds me of some Wagon Christ stuff, with the beat and sounds being very mellow and in a similar vibe. I would imagine it would be good music for chill-out rooms in Clubs. Miles Tilmann is a talented fellow who offers very mellow trance type ambience. The Underland EP is a must for all you people who love a bit of Dance Trance. I personally cannot handle very much Dance Music and there is not a lot of stuff that I like because of the Typical Drum Patterns used. 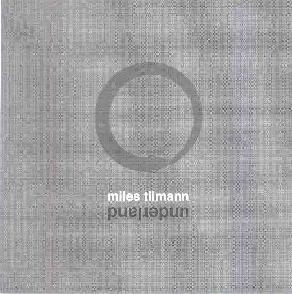 But I must say that Miles Tilmann has got a certain touch that allowed me to listen without the Drum-Beats taking over the soundscapes which I loved. For more information you can visit the Submarine Records web site at: http://www.submarinerecords.com. Contact via snail mail c/o sub:marine; PO Box 5855; Atlanta, GA 31107.